To Ritz, or Not To Ritz? When points and miles enthusiasts talk about aspirational properties and redemptions, you always hear about the showers on the plane and the lavish suites. 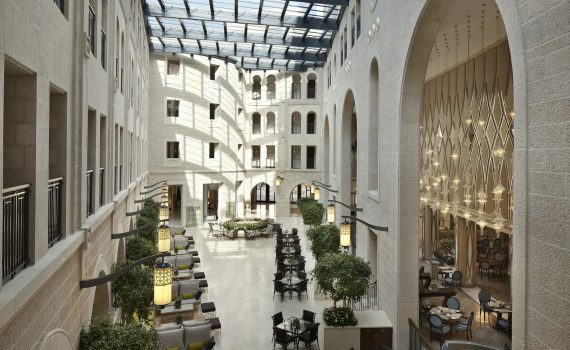 But when miles and points enthusiasts talk about aspirational properties and redemptions in Israel, they don’t talk about the flights (because El Al’s business class is eh); they talk about the Ritz Carlton Herzilya and the Waldorf Astoria Jerusalem (covered here). As many of you know, I am currently in Israel on assignment for my day job through the end of July. Currently, I’m based in Jerusalem, but will be heading to Tel Aviv shortly for the remainder of the summer. Tel Aviv has tons to offer and I’m excited to explore the culture hot spot of the Mediterranean. Being in Tel Aviv also gives me access to the western and Mediterranean coast of Israel, which has a convenient quick train stop to the city of Herzliya. 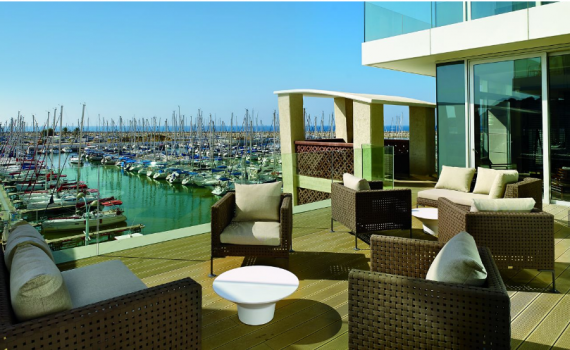 The Ritz-Carlton Herzliya is a Tier 3 (of 5) Ritz property. The property will cost you 50,000 Marriott points; rooms go for about $500.00 a night, giving you about 1 cent to the point. 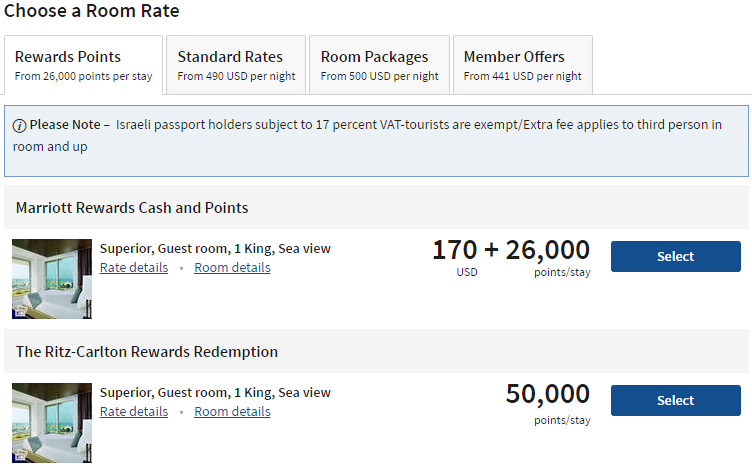 Not bad, especially for Marriott points which are somewhere between .5 – 1 cent per point. The Ritz looks like a beautiful property. All rooms have an sea view and can see the marina. I ask this question a lot, and I’ll ask it again – but can we do better?! Earlier this year, Marriott introduced a cash & points option. This is subject to availability on all their properties. 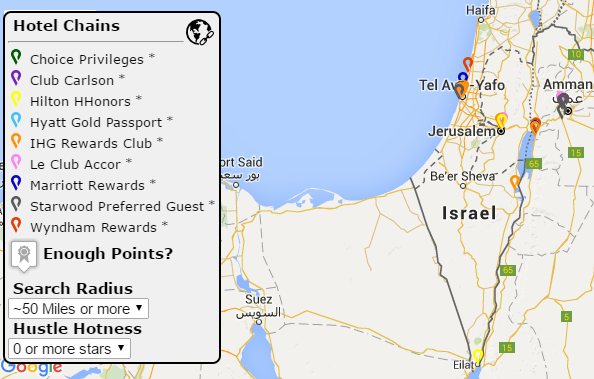 You are buying about 24,000 points from Marriott for the cost of $170. How much would that cost outright? 24,000 points, without any promotions would cost you $300.00, almost double the cost of paying the cash portion. What about for 3 nights? 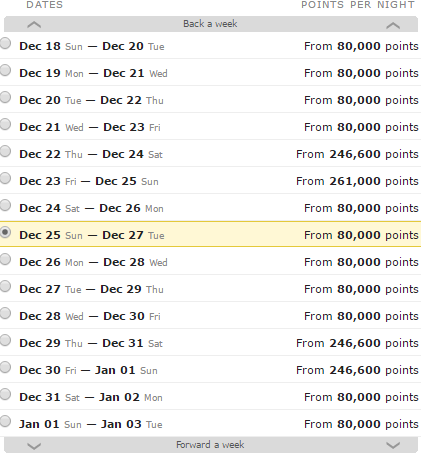 If you didn’t want to do cash and points, you’d need to buy 72,000 Marriott points. Marriott only allows you to purchase 50,000 a year for a total of $625.00. Now, if you could, at $12.50 per/1,000 point, you’d pay $900.00. Again, cash and points wins. 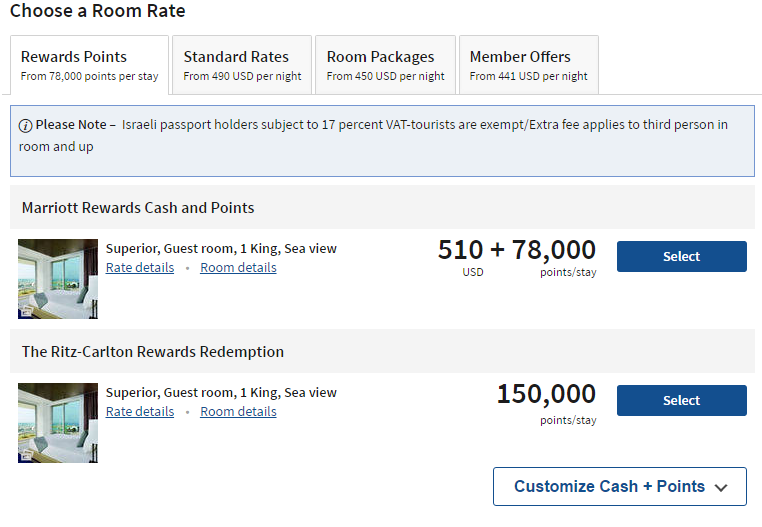 Though this won’t always be the case, Cash & Points at the Ritz-Carlton Herzilya will get you farther with a sign up bonus like 80,000 points. You’d pay $510 and 78,000 points for three nights. If your significant other signs up, you can share your points (for free) and either book 3 nights for 150,000 and no cash, or 6 nights and $1020.00. Oh, you’d actually get seven, because of the 5th night free benefit Marriott and Ritz offer. Chase has a business version of the Marriott card which get’s you 100,000 Marriott points. They also have a Ritz-Carlton premium card which after spending $4000.00 in three months you can get two Tier 1 – 4 certificates. The downside is that there is a $395.00 annual fee. Though the card comes with $300.00 in airline incidentals, unlike AMEX and Citi, this is not an automatic benefit. You need to call in those purchases to be reimbursed. The Ritz card also falls outside of Chase’s 5/24 policy–for now. Finally, a gray market exists for selling these certificates. They go for roughly $300.00 each. If you were to buy two or three, or even one, you’d be better off using Marriott points (if you have them) with cash & points. I do not have any Ritz certificates (and I wouldn’t pay for them on the gray market), but I have enough Marriott points for 1 night outright, or by paying Cash & Points. I”m inclined to pay with Cash & Points, considering Chase’s new rules and my desire to spread out my points as much as possible. Click here to sign up for the Marriott Personal Card from Chase and be on your way to earn 80,000 Marriott points. jetBlue Will Match Your Points – Worth it? On the heels of their easy and amazing Mosaic Status Match, jetBlue is again looking to capture clients from the upcoming Alaska and Virgin America merger with a points match. 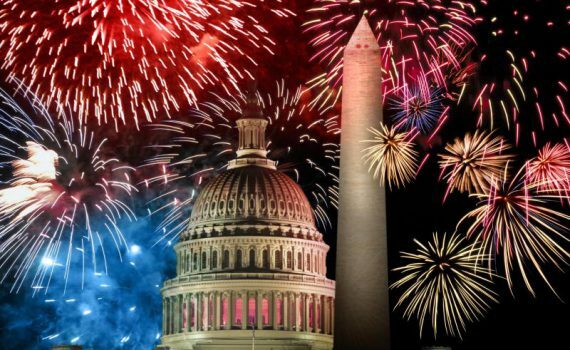 You then must take one round trip flight on jetBlue before August 31, 2016 – again, don’t wait until the last minute! The sweet spot here is in red. You only need 50,001 to get 75,000 jetBlue points. If you already have Virgin America points, then you have nothing to lose (even if you don’t take the flight, though it may be worth it, depending on how cheap the flight is). 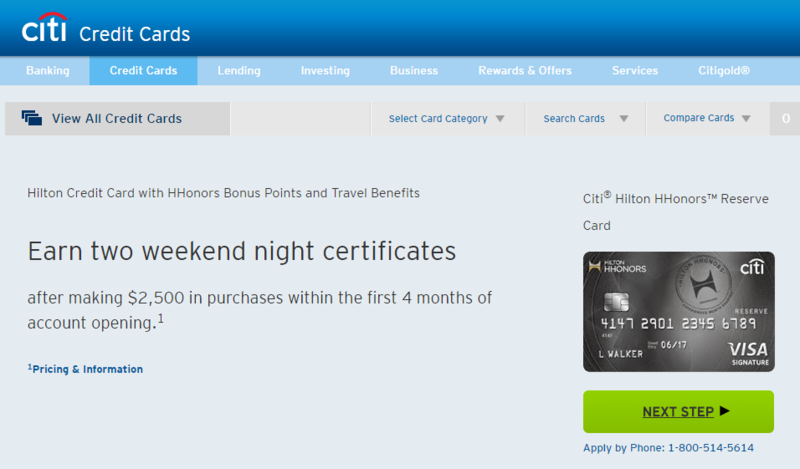 Though you can transfer Membership Rewards (MR), Citi ThankYou Points (TYP) and SPG, the first two transfer at a 200:100. Practically, if you have 1000,000 TYPs or MR you’ll only get 50,000. So you’d have to transfer 102,000 to get the sweet spot above 50,001 for a total of 51,000 (after the transfer). What everyone is talking about transferring are your precious SPG points. SPG transfer 1:1 except when you are transferring 20,000 points. 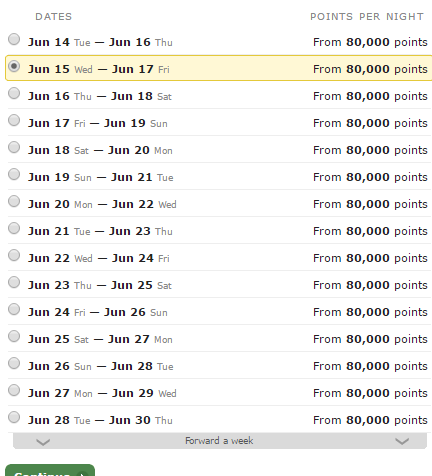 For every 20,000 point increment, SPG will give you a 5,000 point bonus. So if you transfer 40,001 points from SPG to Virgin America, you’d receive 50,001 points, enough to receive 75,000 jetBlue points. This is a really good deal. You’d be transferring 40,000 to receive 10,000 bonus PLUS 75,000 jetBlue points. Even with the flight of $150.00 or so, it’s a win-win. I think that this promotion is only good for those flush with SPG points. With AMEX cards (both personal and business) now once-in-a-lifetime, your transferred SPG points from a bonus, let’s say, is all you’ll get outside of spending and staying at properties on cash stays. Will not take a jetBlue flight by August 31, 2016. I value membership rewards very highly and at 200:100, I’d need to transfer 121,000 Membership Rewards to Virgin Elevate to receive the match from jetBlue. 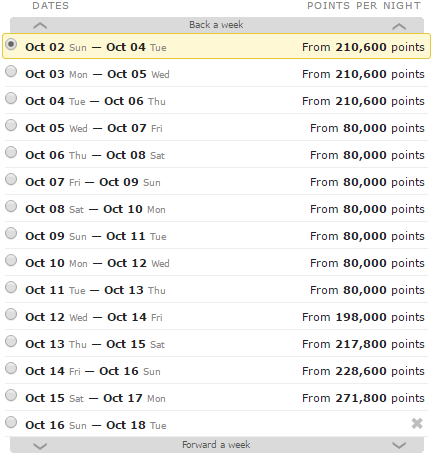 After those jetBlue points post, I’d only net 25,000 points. True, not all of them are equal, but I value my Membership Rewards higher than jetBlue. There are a lot of redemeptions to be had with that many MRs. Even if you live in a jetBlue hub or focus city (Boston, JFK, Puerto Rico, Long Beach), really analyze if you would use your points to fly jetBlue. 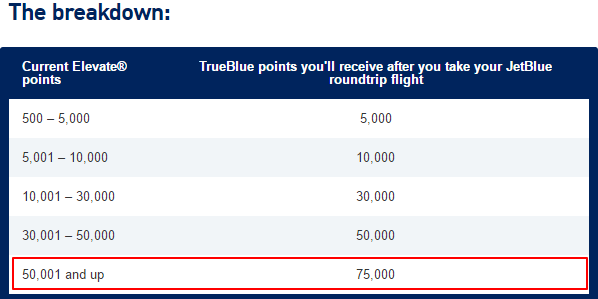 Remember: TrueBlue points operate like Southwest points–they’re based on the price of the ticket. In my experience, whenever I want to take jetBlue (after my successful status match), other airlines are cheaper. One last thing: you could argue that Citi TYPs are not as valuable as MR so those, which also transfer 200:100 may be worth it. I found a lot of value in mine, flying on AA–especially on cheap flights–flights cheaper than jetBlue that also earn qualifying flying miles. What would swing my decision is if I was a Caribbean junky. 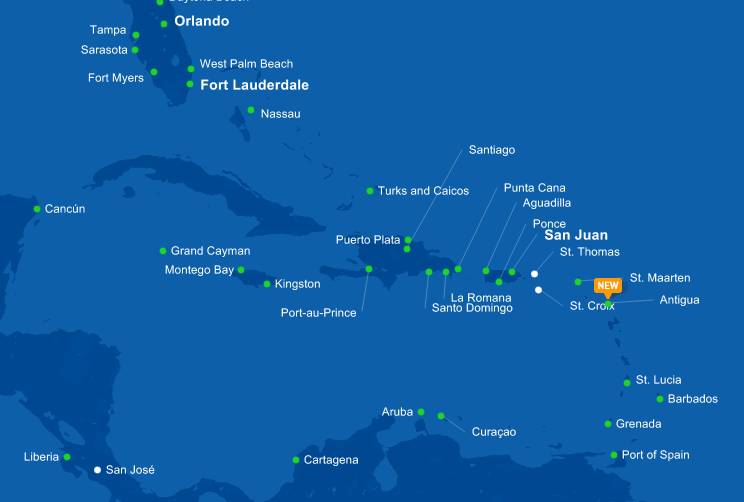 jetBlue offers some of the most non-stops to many, if not all, of the Caribbean islands. 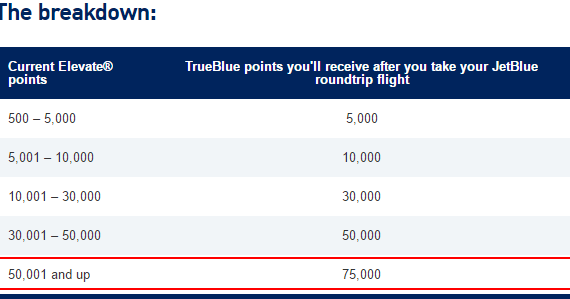 TrueBlue points can certainly get you to many of them, sometimes for fairly few miles. The green are all the direct flights from JFK. So before you make the jump to transfer any of your currencies, really think long and hard about this move: because there are no take backs. The big news this week is that Costco began its switchover to accepting all Visa debit and credit cards. For a long time now, Costco only accepted American Express credit cards and Visa and Mastercard debit cards. Of course, many people had the AMEX Costco card–in fact, it was a huge percentage of their revenue and credit card portfolio. 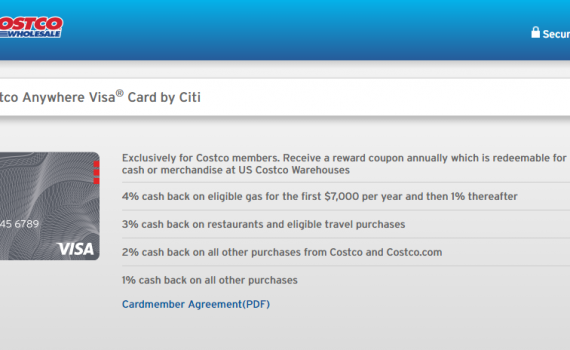 To make a long story short, Citi outbid AMEX for the Costco account (and paid steeply). Not only that, they upped the card by adding 1% more cash bag than AMEX did. The best part? It earns high cash back worldwide. What’s most intriguing about this is that Citi is allowing you to earn cash back on these categories… WORLDWIDE. That’s pretty huge. AMEX, for example, is notorious for only having their bonus categories work in the U.S. (on their proprietary cards, not their co-branded). So if you’re traveling abroad and swipe your Premier Rewards Gold at a supermarket, you won’t earn 3X Membership Rewards. There always is one, isn’t there? For me, it would be the Costco Cash Rewards structure. “Receive a [cash back] coupon annually…” — Practically, this probably means if you apply for the card today and start earning cash back, you’ll receive your coupon of cash back in February 2017, which expires Decemeber 31, 2017. This gives you almost 11 months to use the “coupon”. Most cash back dollars don’t expire. “Just visit a Costco warehouse…” – You need to go to a physical location to use that coupon for merchandise or cash. That doesn’t make much sense to me, but I guess someone who spends a lot of money at Costco and Costco Gas could make some worthwhile profit off of this. Why do I think Citi did this? Well, most people like to shop online and if you have to go into the store to redeem it and them come back to shop with it, chances are you’re going to forget or it’ll just expire and never be redeemed. The only upside is that those who religiously shop at Costco won’t forget because they’d want to use it at Costco anyways to offset their expenditures. That’s probably true. And the earning structure… You can do better. If you’re looking for cold hard cash (back), you can do much better for some of the categories. Let’s say that this card hard a straightforward cash back redemption like other products then it would outclass most cards in Gas, Travel and Restaurants. BUT, there is a convoluted earning structure for all categories. 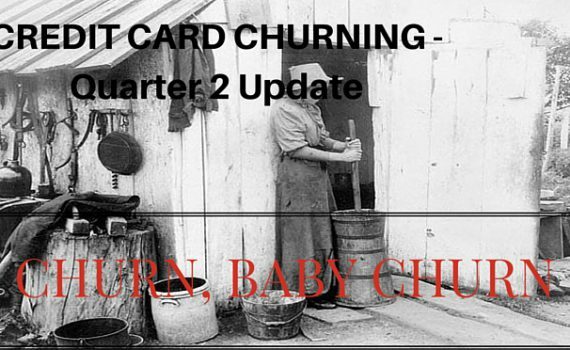 The main sell of the card is earning Cash Back at big warehouse stores, like Costco (duh!). But you only earn 2X, all the time. From now until the end of the calendar year, those with the Chase Freedom cards will earn 5X cash back per dollar at Costco and other warehouse stores like BJ’s and Sam’s Club. Yes, there is a limit, but for your first $1,500 in Costco spending (if you can/will spend that much until December 31, 2016) you’d earn $75.00 cash back (or 7,500 Ultimate Rewards points if you prefer), as opposed to the $30 cash back you’d earn on $1,500 worth of purchases at Costco. Now once that promotion ends (though it usually comes back during the third quarter, especially now that Costco takes Visa, which the Freedom is), you are better off using your Costco Visa–unless you hate the earning structure and redemption policy. In that case, go with the Citi double cash which will earn you 2X cash back per dollar. This card does not carry foreign transaction fees, which is unique for some cash back cards. If the Costco cash redemption option works for you, this could be a solid cash back option when traveling abroad (for dining and travel). You have to be an existing Costco member to apply for the card–the application will ask you for your membership number–that is the annual fee for the card, too. The 4% cash back on gas purchases (including Costco gas) is limited to the first $7,000 per year. Click here to apply for the Citi Costco Anywhere Visa. Weigh the pros and cons, but I’d hold off applying for this card until January 1, 2017… At the earliest. The above quotes are representative of unique routes that airlines fly called “Fifth Freedom Routes”. What are Fifth Freedom Routes? The fifth freedom allows an airline to carry revenue traffic between foreign countries as a part of services connecting the airline’s own country. It is the right to carry passengers from one’s own country to a second country, and from that country to a third country (and so on). 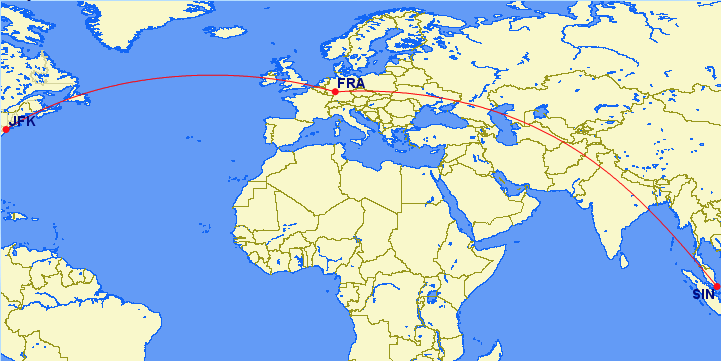 An example of a fifth freedom traffic right is an Emirates flight in 2004 from Dubai to Brisbane, Australia and onward to Auckland, New Zealand, where tickets can be sold on any sector. Fifth freedom traffic rights are intended to enhance the economic viability of an airline’s long haul routes, but tend to be viewed by local airlines and governments as potentially unfair competition. 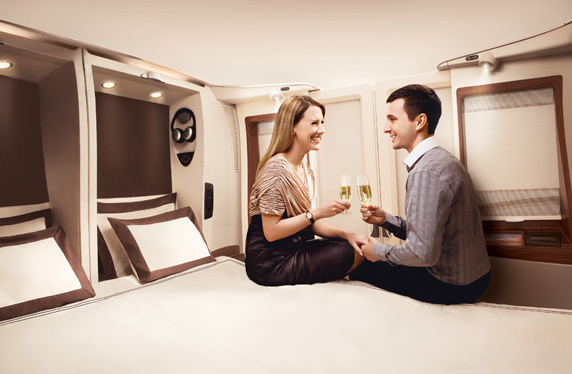 This route is extremely popular among bloggers and miles and points enthusiasts because you can use points to book the JFK – Frankfurt route and fly in Singapore Airlines’ wonderful Suites Class–Without going all the way to Singapore. A lavish way to get to Europe, indeed. So as the “consumer”, why would you want to fly a Fifth Freedom route? This list goes on and on, but there are some really practical, untouched ones that we’ll look at today. A lot of these routes can be paid for using cash (but who does that?! ); however, British Airways is a Oneworld partner and there are several points currencies which transfer to British Airways Avios. The British Airways credit card also currently falls outside of the new Chase churning rules and comes with a 50,000 point bonus after spending $2,000 in three months and then another 25,000 points after spending $15,000 total in one card member year (you may be able to get matched to their recent 100,000 point offer–secure message them, it’s always worth asking). This route operates Sunday and Thursday. 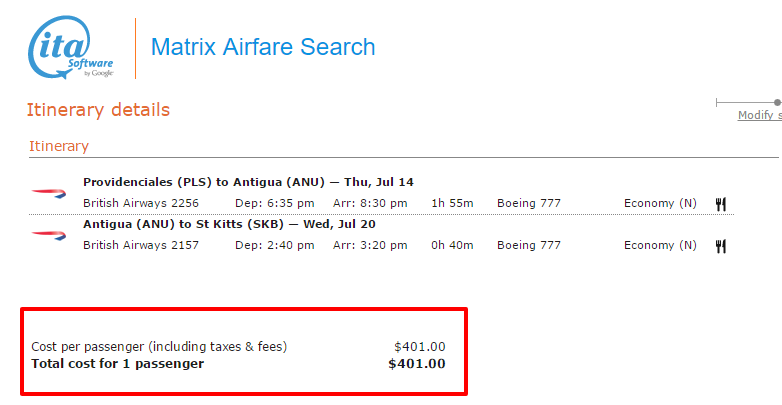 So for 11,500 Avios and $55.00 you can see two additional islands (not three–the first you would arrive at anyways). This is just an example and there can be many more variations. That’s too steep for me! You’d get almost 3 cents to the miles with these redemption and you’d save over $350.00. Before you can do this hopper, you need to get there first! There are lots of options from North America. The greatest number of options are coming from Orlando, Miami (the gateway to Latin American and the Caribbean), Houston and Atlanta. There are scattered and seasonal flights from other east coast hubs like D.C., New York and Chicago. Here are some of the best options for using miles to the Caribbean. For those that are based off of region and therefore “fixed”, your best bets are American’s off-peak or Air France on Delta metal. The only thing that American has that Delta does not is the amount of non-stops from Miami and the East Coast. With Delta, you may have to connect via Atlanta. The crux of this post is about British Airways, so it could also provide good options for getting to your first Caribbean destination. 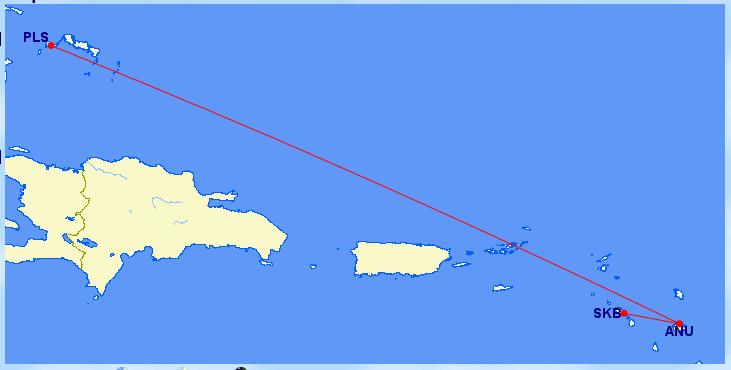 JetBlue offers the most non-stops to the Caribbean from the New York area so if you are going off-peak, there are some extremely cheap redemption’s to be had. I briefly mentioned above, but the British Airways card is currently at 50,000 Avios for spending $2,000 in the first three months, and then an additional 25,000 Avios after spending $13,000 more (for a total of $15,000). You can also, after approval, Secure Message Chase and ask them to match you to the previously higher offer of 50,000 for spending $2,000; an additional 25,000 Avios when spending a total of $10,000; and finally another additional 25,000 Avios after spending $20,000 total in a card member year. You can also earn Ultimate Rewards via cards like the Freedom, Freedom Unlimited, Sapphire and Ink business cards which can be transferred 1:1 to British Airways. I don’t know about you, but I can’t wait to try out one of these routes. Those who follow me on Instagram (@miningformiles) know that I’m currently in Israel. (I’ll be here for two months on assignment, but that’s besides the point). Flying is always a fun experience (heavy sarcasm intended), but miles, points and the perks that come with credit cards can make it a bit more enjoyable. Sometimes, a wrench is thrown into the highly operationalized system of airline operations. Most commonly this is bad weather, but sometimes this is because of pilot strikes or a mechanical error. In any event, sometimes fliers are eligible for monetary compensation for delayed or cancelled flights. 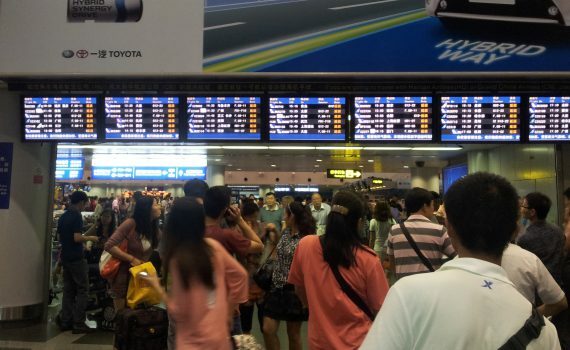 The laws are numerous and complicated, but you are almost always entitled to some sort of compensation when there is a mechanical error which severely delays or cancels a flight. On Wednesday evening I headed to the airport and of course, I received a notification of my delayed flight after already arrived and made it through the security and into the lounge. Delays on DL 468 (from JFK to Tel Aviv) were apparently commonplace. However, I began to wonder why: there was some bad weather, but only earlier in the day. After all, this flight was leaving pretty late (11:55 PM) in the night. Ah, a mechanical malfunction. They needed to send a new plane from Atlanta instead of the flight from San Francisco (the one with mechanical issues). The delay notifications on Delta app and TripIt continued to roll in. I wentto the lounge agent and ask what the problem is: now they have a working plane, but that aircraft is delayed because of bad weather out of Atlanta. Great. Airline employees (baggage handles, flight attendants, pilots, etc,) are heavily unionized. What happens when a severely delayed flight from Atlanta lands in New York? Delta needs to pay everyone overtime and that’s it. They can’t continue working because they’ve “timed out”. At 2:30 AM, they’d be pretty hard pressed to find a fresh crew! After several minutes of getting rebooked (knowing that the flight would indeed be cancelled), I proceeded to collect my luggage… at 2:30 AM, as instructed. Baggage claim was closed. Delta check-in counters were closed. Delta baggage customer service center? Closed. To make a long story short, I ended up getting my bags and on a better flight than the one they had rebooked me on. Because this cancellation was mechanical, Delta owed me compensation. In situations such as this, a $200.00 voucher is pretty standard. The voucher expires within one year and can be used in any class of service on any flight bookable on Delta.com. Pretty good… But I knew I could do better. All transportation to/from airport covered with taxi vouchers – I received four of these; roughly about $280 in value. That’s like the new limited time Delta AMEX credit card sign ups! Know the rules. Even in severe weather, you can usually get the airline to cover transportation to/from hotel, the hotel and food. They usually will not cover lodging if that airport is your home airport. Right after my flight was cancelled, I read the Contract of Carriage for Delta. This is the binding agreement between you and the airline in which you purchased your ticket from. How to find the Contract of Carriage? Google ‘[Insert Airline] Contact of Carriage]’. They’re usually pretty reader friendly. It explains the rules in the event of a cancellation or severe delay. With alternative flights. Airlines will rebook you on one of their flights, or a partner flights. Know your alliances. They will only rebook you on a non-alliance partner (in this case, with Israel, that would be El Al) if there are no other options. Willingness to be flexible. If you’re booked in a business class ticket, they are obligated to rebook you in the same class of service, but if it’s all full, and you need to get to your destination, decide which is more important. PRO-TIP: Sites like ExpertFlyer can help you be prepared with seat-class availability and alternative flight options. Don’t be afraid. A cancelled flight is a headache. No doubt about it. But don’t be afraid to ask for compensation for food, lodging or transportation; call and even send a message to customer service. You’ll usually get something. Be nice. You can get some really helpful and friendly gate agent or lounge agents if you come to them with a smile. Remember, they’re at the airport with the delayed and cancelled flights, too.